An intense focus on research and development, along with continuously modernized production facilities, has resulted in U.S. Tsubaki Automotive, LLC. meeting the ever changing needs of the marketplace. As a part of this vast, international network of corporate and industrial resources, U.S. Tsubaki Automotive LLC offers its customers the finest state-of-the-art timing drive systems available in the world. And Tsubaki is well positioned to meet the challenges of the 21st century as we strive to be the "Best Value" supplier in the industry. We are TS16949, ISO14001, and Ford Q-1 certified. We supply the major automotive OEMs in North America including General Motors, Ford, Toyota, Nissan, Honda, Hyundai, Chrysler, and Magna. We are a system supplier, and understand the unique requirements of each customer. 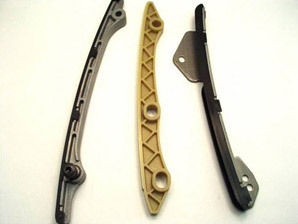 We provide complete services including initial design support utilizing CAD, component and engine testing, and analysis. Mission: U.S. Tsubaki Automotive LLC serves the Automotive Industry by providing top quality Timing Drive Systems to the American Market. Sales growth through Customer Satisfaction. Cost reduction and consistent profitability. Reinforce Quality Assurance System and Environmental Management. Develop opportunities and skills of all employees. 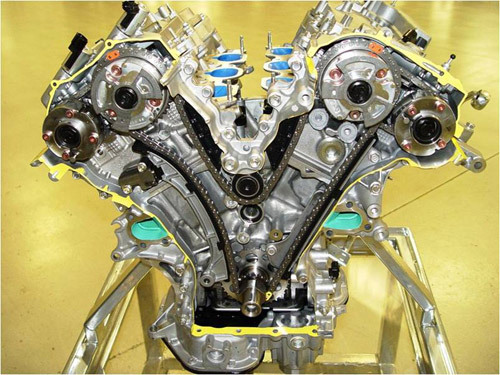 Tsubaki is the world leader in chain technology, and is continuously improving designs and technologies to adapt to an always changing automotive environment. 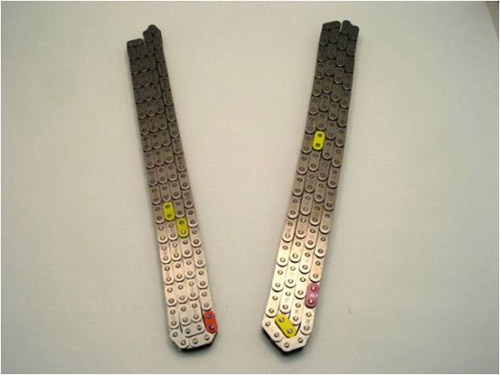 Several Chain types are available, depending on the requirements of the application and the demands of the customer. Tsubaki Roller Chain delivers low elongation wear even in demanding engine conditions. 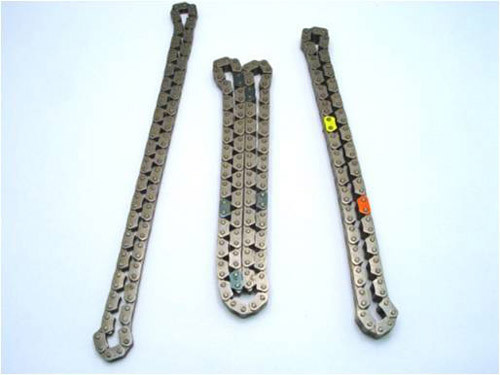 Tsubaki Inverted Tooth Chain has very high strength and excellent NVH performance. Tsubaki Bush Chain has been specially developed for diesel engine applications. It has unparalleled resistance to wear elongation in diesel environments. Available pitches: 7.0mm, 9.525mm (3/8 inch). 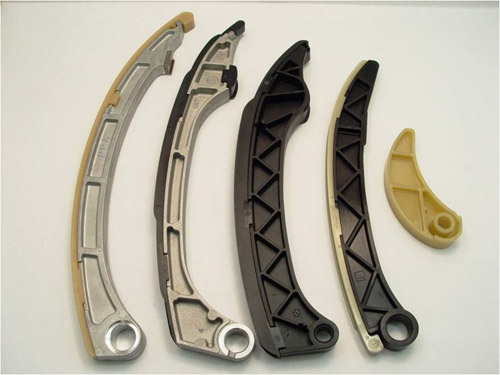 Tensioners play a very important role in automotive chain drive systems. A tensioner, pushing either directly on a chain or on a pivoting guide, takes up slack in the chain circuit, and extends to make up for chain wear and thermal expansion. It also dampens and limits chain movement, which is important to control noise, chain tension, and vibration resonances. Tensioners can be mechanically and hydraulically tuned to meet customer and component requirements. Tensioner bodies are made from high strength Steel, Cast Iron, or Cast Aluminum alloys to attain the optimum combination of fit, weight, and economy. 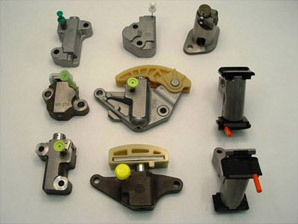 Block Style tensioners are designed to be mounted on the face of engine block. Flange Style tensioners are designed to be mounted on the engine externally. Cam-Cam Style tensioners are designed to be mounted at 90° to the Chain plane (such as on top of a cylinder block), and its compact design can fit within the short chain spans between DOHC camshafts. Sprockets are the rotating elements which both drive and are driven by the Chain. Sprocket design is tightly controlled by Tsubaki to ensure proper mesh, strength, and durability. Various materials, fabrication methods, and heat treat options can be selected, depending on Chain type, load, speed, and NVH requirements. 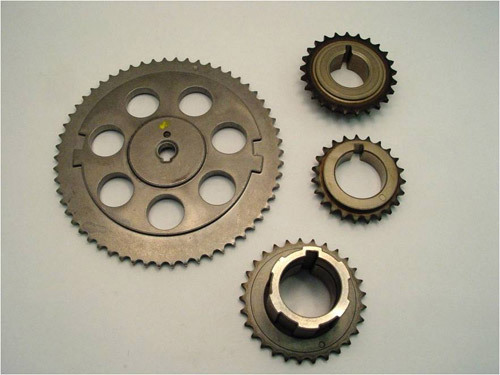 The role of fixed guides is to provide a low friction, wear resistance platform to guide the chain span between sprockets. 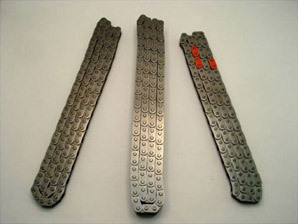 The guide shape is dictated by chain span requirements, interference features, and material wear and strength properties. The guide Shoe (the chain contact portion) material is wear resistant nylon, while the base material is glass filled plastic, aluminum or steel depending on strength and mounting constraints. Smaller or lightly loaded Guides can also be all plastic if loading conditions allow. The lever design and function is similar to the Guide, except its design allows it to pivot. A lever is used in conjunction with a tensioner to take up chain span slack and control chain motion. 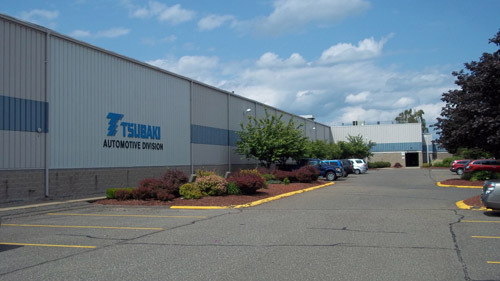 Tsubaki Automotive is looking for dedicated skilled employees to join their staff. Click here to see what opportunities are available.